Just so you know the Conference Board of Canada charges $650 for a report that proclaims that there is no housing bubble in Canada. Unless you are willing to spend money, there's no real way to properly analyze this report's logic. All you can do is read media summaries that mostly forwards the Board's message - "there is no housing bubble so keep on bidding." 1. The gap between real estate prices and income is the third worst in the OECD. 2. The gap between home prices and rents is the second largest in the world. 3. Canadian household debt is almost at a record level. 4. 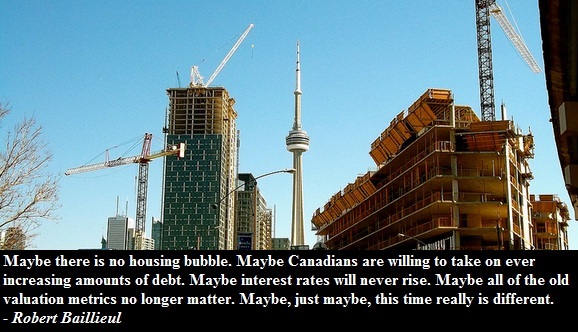 The Canadian economy has never been so weighted to real estate. 5. REITs have never been so expensive. 6. The entire financial system is at risk. Real the full report by Motley Fool here.